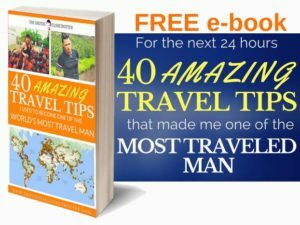 The Single most powerful tool you have as a traveler is the power to communicate in different languages with the local population. This is what will make the difference in your experience in that country you’re visiting abroad.Yet many people are scared of going to countries that don’t speak their native one and will exclude them entirely from the choice range. When you leave home to this new holiday adventure, would you rather be a simple observer or a full-blown participant? Well, the answer was pretty clear for me when I started traveling, and this is one of the reasons why I am still on the road after more than 10 years, keeping things interesting! I am now learning my 7th language and still have plans to learn more. See it like this: Not knowing English nowadays is like not being able to read 30 years ago. Let me tell you that with the world’s borders getting smaller and communication between nations easing up, not mastering at least a second language in 30 years from now will be equal to being illiterate 30 years ago. Some countries have been quick on the trigger in understanding that! Swedes and Dutch already speak better English than many native English speakers! I actually understand them better than most accents in England, Ireland, and Scotland. Having a country which speaks your language better a second language than your primary language… well that’s pretty awkward, isn’t it… I was recently in Romania and was blown away how many people are already fluent in English, as well as how many English expressions and slang have been absorbed by their native Romanian language. Coming from a country that not even 30 years ago was still in a deep dictatorship and closed to the outside world, that’s pretty damn good! But isn’t “English just enough, everybody speaks it anyway”? True, if you one of those that stick to those boring holidays all included for a week in a 4-star hotel sipping piña coladas all day and not even seeing a local person outside the pool bartender… Or the good old overdone and overcrowded destinations like Paris, Barcelona, Rome and other Western European Capitals… But that’s not who I’m addressing myself to right here. We’re talking about those new destinations, a little bit of exploration, getting out of the beaten track, at least a little bit, making your adventure more interesting! Locals will treat you differently; you will make new friends, not just another backpacker buddy in a hostel! That’s boring… I’m talking about local friends, with different culture, different behaviors things that will shock you, inspire you! That’s like adding seasonings and spices on a steak! It gives your travel flavor. “Isn’t there too many languages in the world, like trillions of them”, you might say? Yup, There are many of them out there… But the good news is, 5 of top 10 most spoken languages of the world can get you covered in most the world! 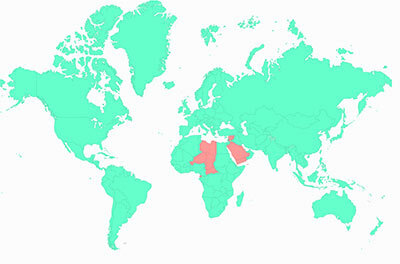 To illustrate my point, just have a look at the following maps I Created Bellow. 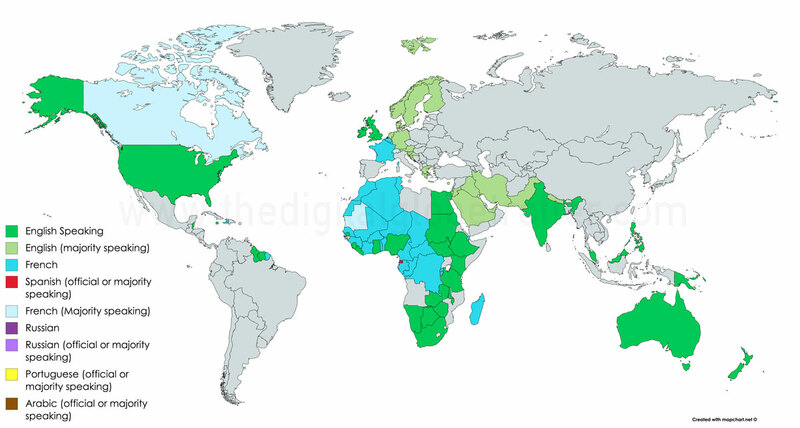 With English, you can get by most countries that’s for sure, I have highlighted them in Green where they are official languages, but also where they are unofficial, co-official, majority spoken or widely understood by over 50% of the population. Adding French to the equation, that widens the reach by quite a lot! And that with only two languages in your toolbox! You can now travel to many African countries by yourself and most people will understand you. I have also highlighted Canada, Switzerland, and Cameroon in lighter blue here because of their very high population of French speakers. 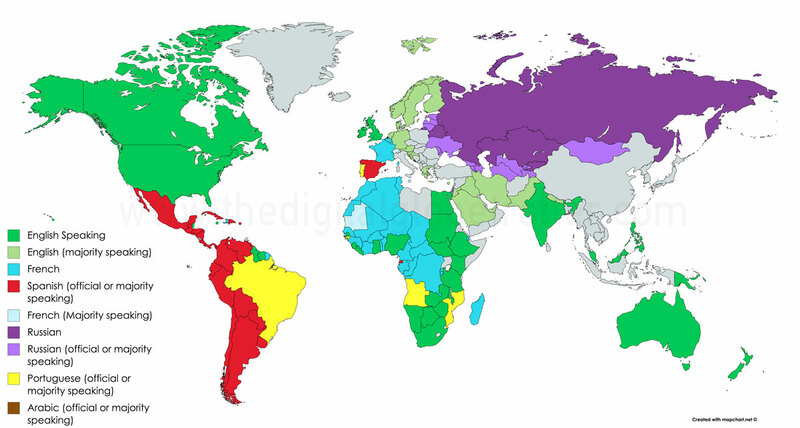 Adding Spanish, start packing because you are sorted for Central and South America, covering almost the whole continent from Mexico to Tierra del Fuego! 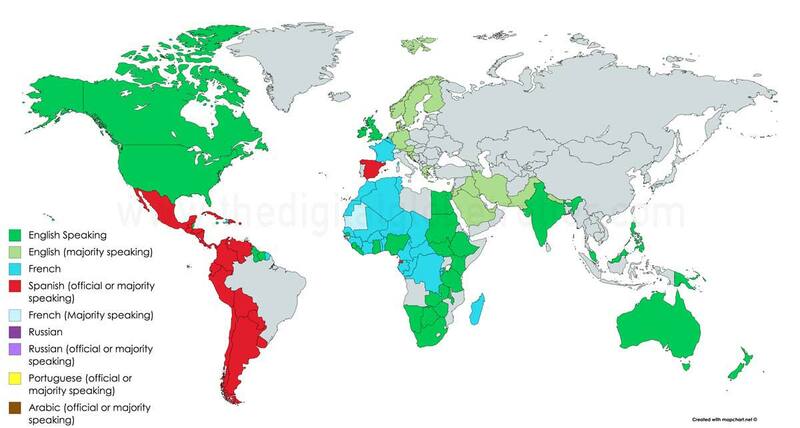 And quite sincerely, I’ve seen many Spanish speakers get by quite easily in Brazil with no problem! This one is a no brainer, and has been one of my favorite languages to learn in the past 4 years. It has created countless opportunities and interesting experiences. Most eSoviet countries are still very absorbed in their “own world” and you will find very few English speakers in those ex-soviet states. So Russian is definitely a plus and local populations will welcome your efforts. One personal favorite story of mine was when I was received for 2 weeks in a family of 20 in Dushanbe in Tajikistan, close to the Afghan Border while waiting for a Visa, Russian being our only mean of communication. Now adding Portuguese, you are set to explore Brazil, which by itself takes a lifetime to explore. 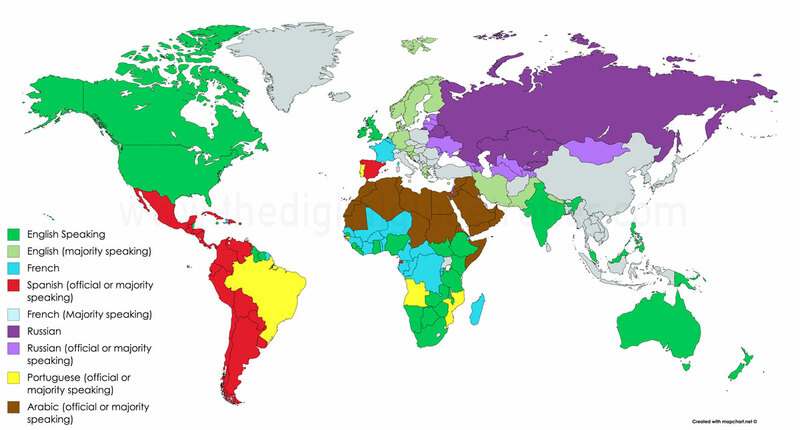 As I have already explained in my Brazilian Page, Brazil is more of an empire containing 26 states, which could be easily be countries of their own. That makes Portuguese even more interesting. You also now have access to Mozambique and Angola, as well as a pocket of other African countries. I even managed to speak Portuguese in Goa and in Macao in China with an old lady in the market! 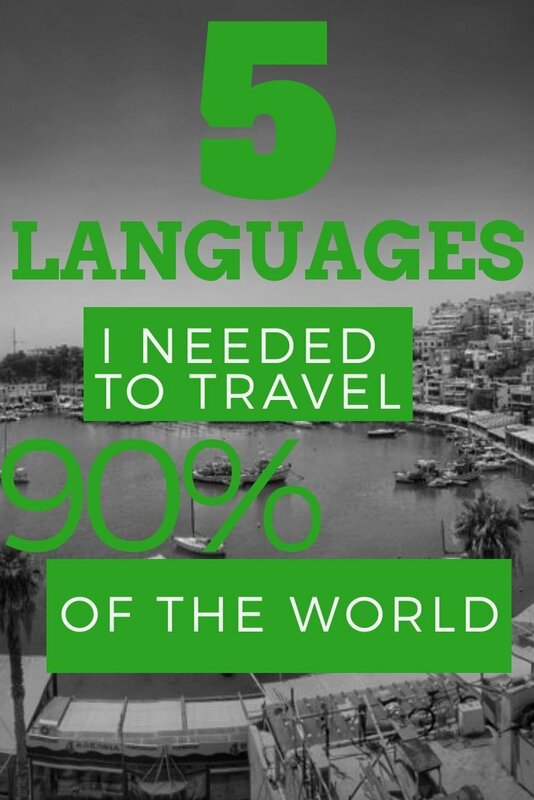 So with these 5 languages, you are pretty much sorted for most of the world. But I decided to add another bonus one. 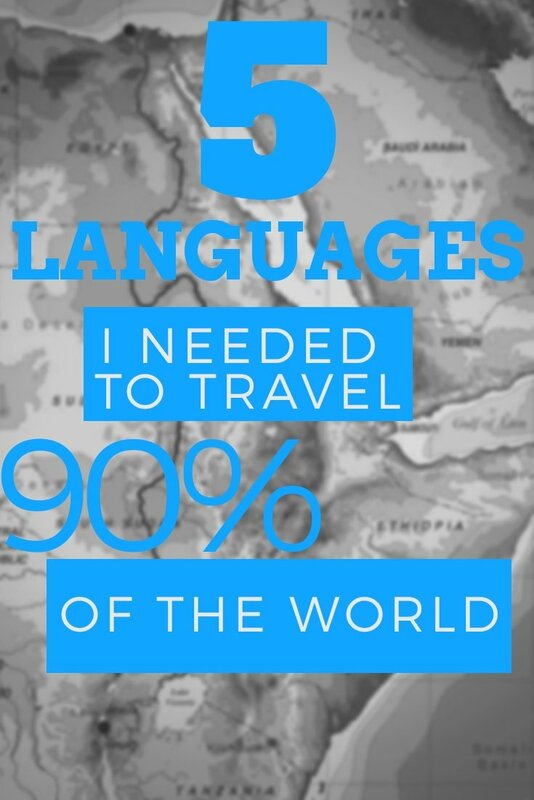 Arabic is spoken by over 400 million people in over 25 countries, and this is the reason I am learning it at the moment, as I am preparing to set off for many of those countries while I finish my last countries left in the world. I added it as a bonus and not an essential one because, in most Arabic countries, you can get by with English or French just fine. This is the only language I don’t speak yet, but plan to learn. I didn’t include country-specific languages like Indian, Indonesian or Mandarin. Because in the case of Mandarin for example, outside of China, that won’t help you much… Unless you hang around those Chinatowns you’ll find in any country that has a decent diaspora of Chinese. 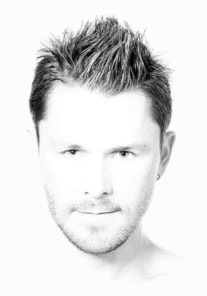 Make no mistake, Even though I speak 6 languages and learning a 7th, I’m no language genius… I just work hard and created my own personal strategy that I know works. My strategy is what I call the “passive way”. If there is interest about it let me know and I can write an article about it to help you get on the right foot. But basically, I just recommend learning basic grammar in books, and then immerse yourself for a while in a country that speaks the language, that way you and practice with locals, effortlessly! If you’re single, why not meet a local girlfriend or boyfriend? That will definitely push you to learn, quickly! 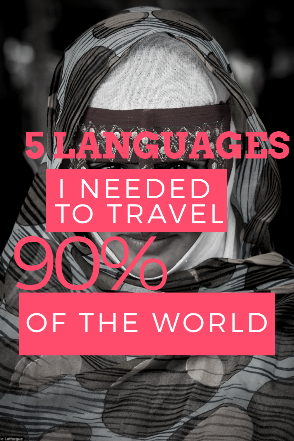 Do you agree with my argument about the importance of languages and communication in traveling? What would be your choice as your next language to learn? Let me know!